Hydraulic Root Cutter Kit 1/2"
The best solution for pipes that are blocked by roots, hard grease, compacted sand or soil. 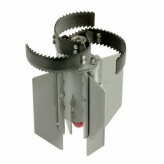 The rootcutters are powerful, reliable and easy to use. 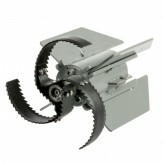 They consist of a central body with knives in different sizes and matching skids to keep them centralized in the drain. The knives have sharp angular teeth at front and rear. The hydraulic root cutter works on every machine with a minimum water flow of 40 litres per minute and is fitted with 3 cutting blades and skids for different diameters of drains and sewers.